It’s not a bus and it’s not a light rail – trackless trams are a mix of both, and they can bring myriad benefits to public transport systems in Australia’s cities and suburbs, writes WA Scientist of the Year Peter Newman AO. Forty years ago I began my life as an activist academic when the WA State Government closed down the Fremantle Railway. I ran a four-year campaign to save the railway, and I have been writing books and running campaigns ever since on why rail transit is better than buses. Steel wheels on steel tracks are better for efficiency and ride quality. But something has changed in bus technology, and I’ve changed with it; the trackless tram has emerged to create a rail-like option at much lower cost. It is not a bus rapid transit (BRT) system and it is not a light rail transit (LRT) system, but a new hybrid of the two with the benefits of both, especially rail-like ride quality, capacity and speeds. Why is rail so popular now? Every city is finding it impossible to maintain traffic speeds that are competitive with rail technology. Sydney has been building rail projects and putting more trains onto existing lines for years, and the results have been spectacular, with rail’s patronage growing 45 per cent in the past seven years. But Sydney has also come quite late to building light rail, and the project is now highly controversial. New light rail systems replaced old trams and began growing rapidly as a transformative transit system across the world’s cities in the 1980s. Beginning in the medium density cities of Europe, the movement spread to the car-based, low-density cities of Canada, the US and finally Australia in the past 20 years. Light rail is a connector, linking heavy rail stations to surrounding areas and sometimes completing shorter corridors that have no access to rail lines. In most cities, these tram-like functions were being filled by buses, but they were failing on two fronts: buses were not offering an adequate alternative to cars, so city roads were staying congested; and buses did not enable denser development, so cities were sprawling rather than redeveloping. New light rail projects had many success stories showing they were able to compete with cars and promote denser development, so commentators like me did our best to make them policy-relevant. I was a big supporter of the Sydney Light Rail when I was the NSW Sustainability Commissioner in 2004-05. However, I have changed. I think the Sydney Light Rail will be a huge success, but at $175 million per km and with four years of disruption to the local economy, I cannot see it having much future elsewhere in Australian cities. Fortunately I can now see a better option: I believe light rail will be replaced by trackless trams, a technology created by applying innovations from high-speed rail to buses. What is a trackless tram? Trackless trams are neither a tram nor a bus, even though they have rubber wheels and drive on streets. The high-speed rail innovations have transformed a bus into something with all the benefits of light rail and none of its downsides. I went to China to have a look at the CRRC Trackless Tram (they call it an ART or Autonomous Rail Transit) to check it out and came back convinced we had a transformative, new transit technology. It replaces the noise and emissions of buses with electric traction from batteries recharged at stations in 30 seconds. It has all the speed (70 kph), capacity and ride quality of light rail with its autonomous optical guidance system, train-like bogies with double axles and special hydraulics and tyres. It can slide into the station with millimetre accuracy and enable smooth disability access. 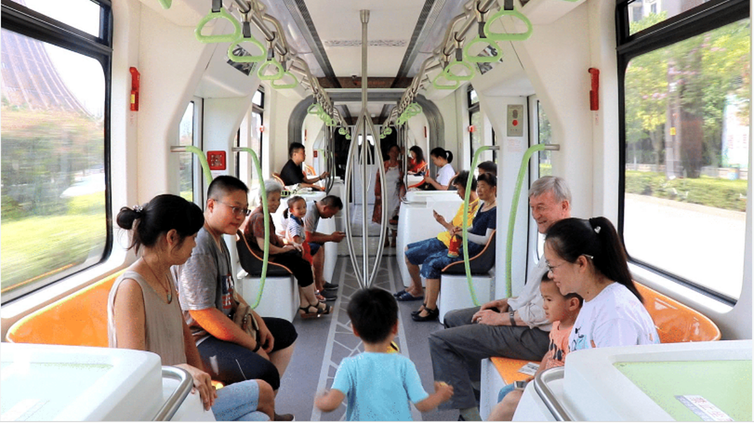 It passed the ride quality test when I saw kids running up and down the CRRC Trackless Tram while it was going at 70 kph – something you can only see on a train and never on a bus due to the sway. The autonomous features mean it is programmed and optically guided, with GPS and LiDAR, into moving very precisely along an invisible track. But if an accident happens in its path, a ‘driver’ can override the steering and go around; it can also be driven to a normal bus depot for overnight storage and deep battery recharge. It is half the weight of a bus and can go up 13 per cent slopes, compared to 5 per cent with light rail. The standard trackless tram system is three carriages that can carry 300 people, but it can take up to five carriages and 500 people if needed for big events. 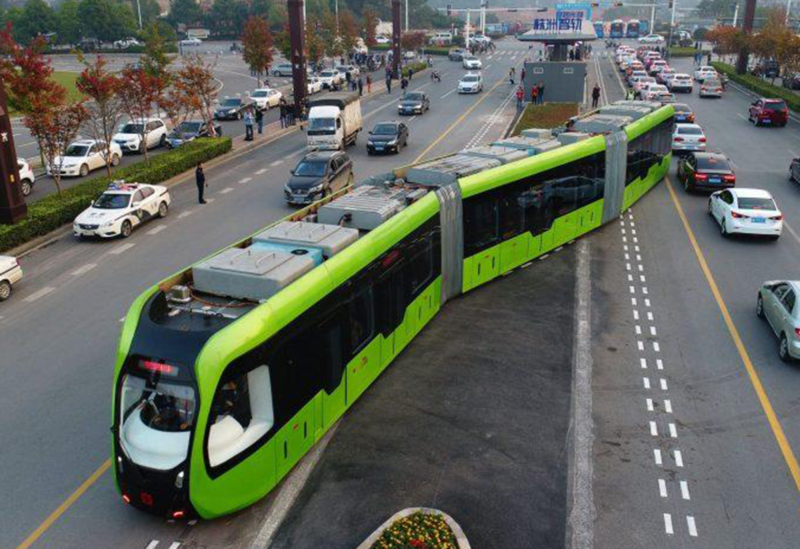 The trackless tram is also very light, weighing half of a diesel bus as it does not have a big heavy engine. And with the lack of swerving and sudden stopping due to its autonomous driving, it’s not likely to cause rutting that way buses and trucks do. In three years of trials, no impact on road surfaces has been found. Why will trackless trams catch on? The worst features of LRT that trackless trams are likely to replace are disruption and cost. Disruption to local economies is a major issue, as it can take years to lay the rail tracks. If you take Sydney as an example, the process has become more like a service renewal project than a rail project. All underground services in the Sydney LRT corridor have been replaced and put in a huge pipe with 1 meter of concrete laid over the top, which has led to massive disruption for businesses along the route. Similar disruption has occurred in the Gold Coast, Canberra and elsewhere, but the result has ultimately been a highly successful system in terms of patronage and attracting land development, as will happen when the Sydney LRT is complete. However, the cost has been growing far beyond all original expectations, and certainly mine. Sydney is now spending more than $175 million per km; the Gold Coast cost was similar, and Canberra and Newcastle cost more than $80 million per km, as did the now-cancelled light rail project in Perth. A trackless tram, on the other hand, can be put into a road system over one weekend and costs only $3 million to $4 million per km. This will, however, require road changes so it can have a free run, which will vary in cost depending on the city’s existing provision of busways and priority at lights. For me, the big advantage is that the trackless tram will likely attract development around its stations in the same way that LRT can. That is the missing link in our cities: How can we unlock urban regeneration and prevent our cities sprawling ever outwards (creating cheap housing but expensive living), while the well-placed inner and middle suburbs become more and more exclusive? The divided city needs something that can unlock affordable medium- and high-density housing in new urban centres. I think it’s the trackless tram that can enable this kind of urban regeneration. I have had numerous discussions with the urban development industry and am convinced that the trackless tram will bring viability and life to urban areas, especially those that are needing urban regeneration. The trackless tram has a cost that can be afforded as a contribution to any new development and will bring the uplift in land value that unlocks investment. My colleagues and I have developed a model that shows governments do not need to find all – or even any – of the capital costs. This is how trams were first built: as real estate projects. But governments are needed to manage the process and create the land assembly. They need to lead community engagement, and decide where best to route such a system and how to manage it as a part of a public transit system. Governments can also help with risk management on the financing, similar to how City Deals function. Around the world, trackless trams are under development by bus and rail companies that are finding the extra value in implementing autonomous technology and other smart innovations. Cities are lining up to be the first to trial these new systems; we have been approached by three cities in Africa, two in Europe and one in the US to see how we can help them plan for a trackless tram. Australian cities moving to use trackless trams are: Townsville; Hobart; Melbourne in Fishermans Bend and Point Cook; Sydney in Liverpool out to the new Western Sydney Airport and the Inner West along Parramatta Road; and Perth, where five separate corridors are competing to be the first to trial the trackless tram system. It’s been a 40-year journey for me to see the transformative potential of this new trackless tram transit system and to actually say that I think it will end the need for new light rail projects. Others looking at the technology would rate some characteristics higher or lower, but for me the trackless tram looks a winner due to its ride quality, land development potential and cost. Time will tell if the early demand for the trackless tram translates into a real transformation for public transport. But to me, I think it has the potential to take off like the early adoption of trams in the 1890s – but without needing the tracks.